The move comes days after State Sen. Daniel Biss dropped Chicago Ald. Carlos Ramirez-Rosa from his ticket. 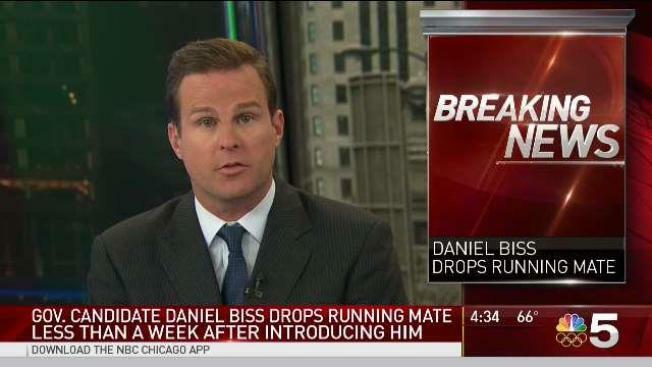 State Sen. Daniel Biss dropped Chicago Ald. Carlos Ramirez-Rosa as his running mate in his bid to be the Democratic candidate for Illinois governor Wednesday. Mary Ann Ahern reports. State Sen. Daniel Biss has named his new running mate two days after dropping Chicago Ald. Carlos Ramirez-Rosa from his ticket. Biss announced Friday on social media that Rockford State Rep. Litesa Wallace will join the senator's bid to be the Democratic candidate for Illinois governor. "Meet Litesa Wallace," Biss tweeted, "a progressive champion, a relentless fighter for working families, and my running mate for lieutenant governor." Earlier in the week, Biss said he and Ramirez-Rosa "reached a difficult decision about our ticket," noting he would be "moving forward with a new running mate." The change came after backlash - including a lost endorsement - over Ramirez-Rosa's support of the Palestinian-led "Boycott, Divestment and Sanctions" movement calling for boycotts of companies that do business with Israel. "Growing up with an Israeli mother, grandparents who survived the Holocaust, and great-grandparents who did not survive, issues related to the safety and security of the Jewish people are deeply personal to me," Biss' statement reads. "I strongly support a two-state solution. I support Israel’s right to exist, and I support Israel as the homeland of the Jewish people. I also care deeply about justice for Palestinians, and believe that a vision for the Middle East must include political and economic freedom for Palestinians," he continued. "That's why I oppose the Boycott, Divestment, and Sanctions movement, or BDS, as I believe it moves us further away from a peaceful solution." Biss said that Ramirez-Rosa indicated in his interview prior to selection that he opposed BDS, but "after much discussion, it’s become clear that Carlos’ position has changed." "While I respect his right to come to his own conclusions on the issue, it simply wasn't the understanding we shared when I asked him to join the ticket," Biss added, calling the change "the right decision." Congressman Brad Schneider withdrew his support for Biss' campaign Sunday, citing concerns about Ramirez-Rosa's "past comments about the United States support of our ally Israel, and his affiliation with a group that is an outspoken supporter of the Boycott, Divestment and Sanctions movement against Israel."